When we moved into our house two summers ago, we were presented with an abundance of blank walls. Since the walls of our previous home had been covered with windows and built-ins, we hadn't had the space for a lot of art and other hanging decor. Knowing that we couldn't afford large scale art, I went on a bit of a mirror bender, trying to cover some of the blank space at a lesser cost. 1. Shape. Review what is already in your room. Consider adding a round mirror if the furniture is filled with right angles, or a rectangular mirror to balance out a curvy couch. This bone sunburst mirror (click on thumbnail above to enlarge) adds texture and drama, and will balance a boxy space. 2. Frame. While wood-framed mirrors are readily available, hunt around for more interesting finishes such as mother-of-pearl or venetian glass to make your mirror stand out. Ever heard of a statement necklace? 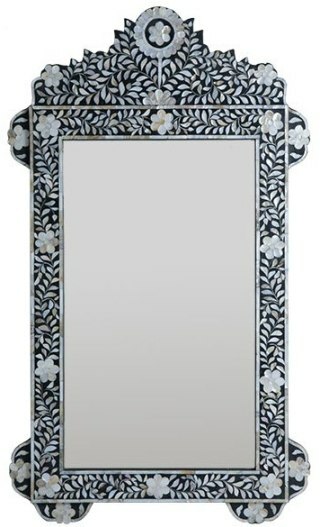 This inlaid mother-of-pearl flower mirror is a statement mirror! 3. Placement. If you think you know where you want to hang the mirror, pause and reflect on its reflection before putting a nail in the wall. Will it reflect a TV? Will you be staring back at yourself sitting at the kitchen table? Will the sunlight be blinding once it hits that mirror? Reflection is key -- if you don't think about it, the results can be distracting, creepy, or painful. 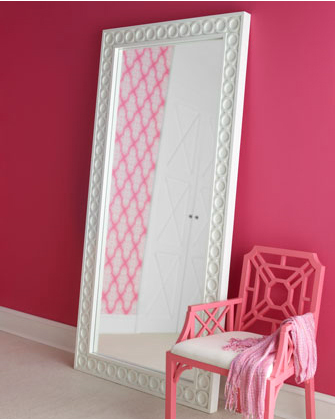 Reflecting closet doors and pretty wall treatment (with this Aster floor mirror)? Lovely! 4. Function. Is the mirror going to be decorative, functional, or both? Some mirrors, like a classic convex, won't do you much good if you're trying to put on your lipstick. Also, the mirrored surface of some more cheaply made (and therefore attractively inexpensive) mirrors are very poor quality. These are fine for decorative purposes, but if you look in them for too long, your face will start to look wavy (you know what I mean if you've seen one). 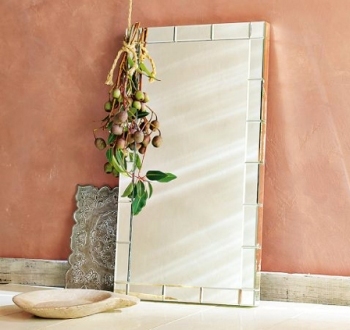 This mirror-framed wall mirror is uber-functional and beautiful. 5. Potential. I have gotten some GREAT mirrors at big box home stores and vintage shops that were dogs at first glance. While the quality was fine, something about them was off. If the underlying design works for your purposes and the price is right, think about how you could change it up to make it work. Take a can of spray paint to it? Add a frame of your own? 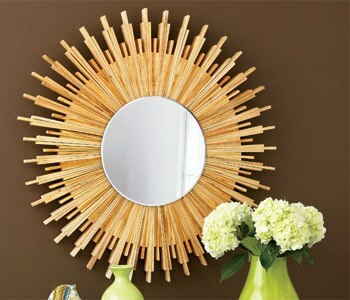 Check out this amazing DIY sunburst mirror made with a basic craft store mirror and some shims. Ready to shop? In addition to local home meccas such as The Cottage in Concord, Comina in Wellesley (among other locations), and Hudson in Boston, my favorite online shops (some of which also have local stores) for mirrors include Pier One, West Elm, One Kings Lane (they don't always have mirrors, but when they do, they're great), Ballard Designs, Wisteria, and Horchow. Need more mirror inspiration? Visit my Mirror, Mirror board on Pinterest!